To mark Bonsucro Global Week, we’ve caught up with some of the speakers to find out about their work driving a more sustainable sugarcane supply chain. Diana Visser of Corbion was part of the panel on cane sustainability in Thailand – read some of her insights below. Can you tell us more about your role as Senior Director of Sustainability at Corbion? Corbion is a leading supplier of sustainable solutions for a variety of different applications, ranging from solutions for shelf life extension that can help prevent food waste to biochemicals and bioplastics. As Senior Director of Sustainability, I lead the development and execution of Corbion’s global sustainability strategy, which focuses on three key initiatives: responsible sourcing, responsible operations and sustainable solutions. Our responsible sourcing initiative aims to create a sustainable supply chain for Corbion’s agricultural raw materials, of which cane sugar is a key priority. For our own operations, we aim for zero incidents and zero waste. Last but not least, our sustainable solutions initiative focuses on the development of innovations with proven social and/or environmental benefits, underpinned by life cycle and social impact assessments. How does Corbion approach the responsible sourcing of cane sugar? A significant part of the environmental and social impact in our value chain is upstream of our own operations. Sugarcane farming has been linked to a number of serious social and environmental risks. Implementation of sustainable agriculture is the only way to maintain economic performance while minimising the damage to the environment and creating thriving farming communities. Corbion is not directly involved in the growing, harvesting, and processing of sugarcane, but is working closely with the sugar mills to addresssocial and environmental issues at the farm level. We also recognise that many of these issues are systemic and require a landscape approach. Bonsucro is an excellent platform to collaborate with other stakeholders to drive positive change in the sugarcane sector. We cannot do this alone; the recent progress on the implementation of the Bonsucro standard in Thailand would not have been possible without aligned messaging on the relevance of sustainability by multiple large buyers of sugar. What are some of the positive impacts has Corbion experienced as a result of achieving Bonsucro certification? With the Bonsucro certification, we now offer our customers the guarantee that the sugarcane used to produce lactic acid was grown with respect for people and the planet, supporting the principles of sustainable agriculture. This is for instance really important to our JV partner, Total Corbion PLA, who has recently started the operations of a new Poly Lactic Acid (PLA) plant co-located with Corbion’s lactic acid plant in Rayong, Thailand. PLA bioplastics are 100% bio-based and have a low carbon footprint compared to fossil-based plastics such as polystyrene.With such a strong sustainability-based value proposition, it is critical that the entire supply chain operates sustainably. As one of the first buyers of Bonsucro-certified sugar in Thailand, Corbion demonstrates leadership in sustainability, showing that we ‘walk the talk’. We have also noticed an impact on employee engagement. The implementation of the Bonsucro chain of custody certification at our plants in Thailand and Brazil required support from colleagues across multiple departments and all of us went the extra mile to get it done. The first deliveries of Bonsucro-certified sugar were celebrated with our suppliers, the Bonsucro-certified farmers and a large group of colleagues, demonstrating their excitement about this achievement. The theme of this year’s Bonsucro Global Week was ‘Scaling Impacts’. What outcomes would you like to see from multi-stakeholder collaboration to achieve sustainable sugarcane at scale? I would really like the industry to go beyond a ‘risk-driven’ approach towards an approach where we all start demonstrating the positive impact of sugarcane. The bio-economy is a huge opportunity for sugarcane, and offers an alternative outlet for sugar with significant growth potential. 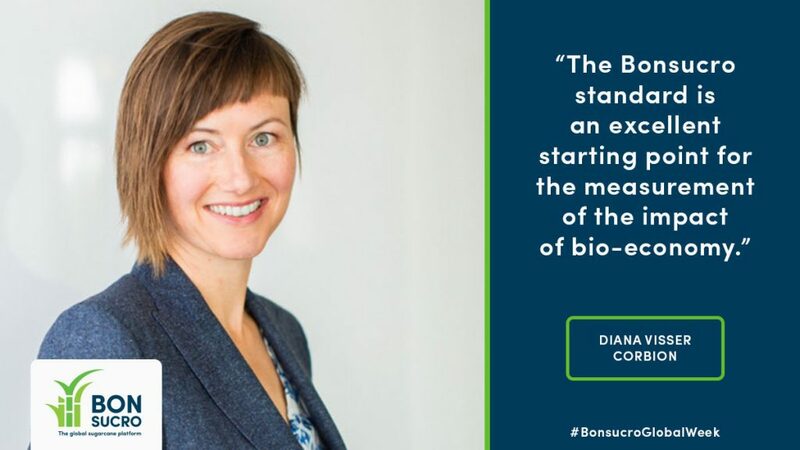 This bio-economy can only be successful if it is based on sustainable sugarcane, so this can be a real driver for the uptake of good agricultural practices.Being metric-based, the Bonsucro standard is an excellent starting point for the measurement of the impact of bio-economy, using tools such as Life Cycle Assessment. Sustainable sugarcane can make a really positive contribution toward reducing carbon emissions. Sugarcane fields absorb CO2 in the sugarcane roots and in the soil. By applying conservation tillage and nurturing the soil with organic matter, the soil can act as a carbon-sink and help remove CO2 from the atmosphere.